Little Chamonix at Shepherd’s Crag, Keswick, was the last time I climbed rock. I did it with my leg in an external fixator, after a series of operations to work on the damage done by a rock climbing fall. I didn’t think at the time it was going to be my last climb: climbing with my leg in the frame was just one more challenge to keep me motivated during my recovery. But since we made the Little Chamonix film in 2013 I’ve had to endure more surgery, more of the mind numbing tedium of recovery, and I’ve done a few more challenges too. Since that climb, I’ve changed so much. After the most recent surgery at the start of 2015 a week after my Mother of Adventure trip, my ankle is now locked in position with metal bolts holding it firm. When I saw the consultant last summer about my elbow, he told me that it has a limited lifespan before I need more surgical intervention: that’s either joint replacement, fusion or the other which I can’t bring myself to write. I was immobile at the start of the year so I had time once again to dream up some challenging goals. If I can’t be a climber any more, I thought I’ll be a cyclist. That might seem a strange revelation, if you have been following the challenges I’ve done over the last four years: I’ve cycled coast to coast, twice, once with a broken leg and taking 8 days and once in a day. I’ve also cycled from the lowest point in Britain to the highest. At that time I was still in recovery and cycling was the only way I could get out. For two of the three challenges I had to use a recumbent. I was cycling, but my heart was reluctant. I was still happier in baggy pants with a patina of chalk than Lycra with nothing left to the imagination. For my next challenge though I was ready to embrace cycling, Lycra and all. My challenge for Autumn 2015 has been a self supported and solo journey. 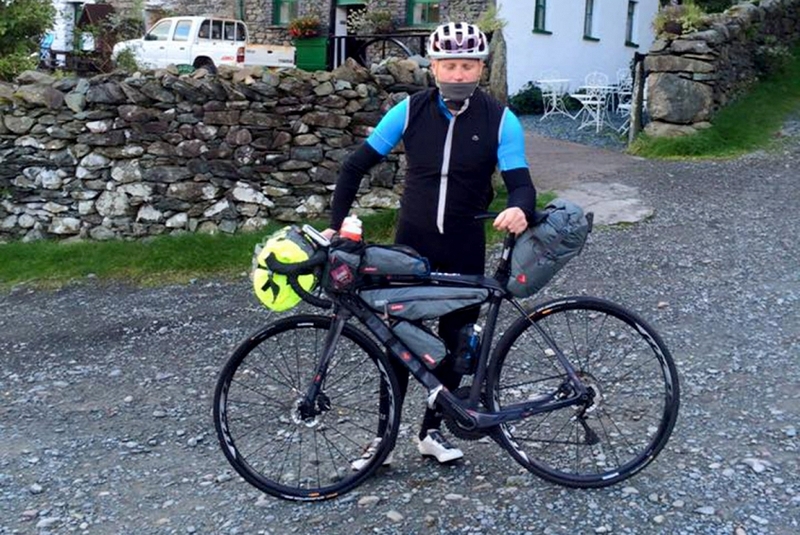 A true sojourn from climber to cyclist, from Little Chamonix in Keswick to Chamonix, France. My previous challenges have involved teams of friends, extensive planning (on their part if not mine), lots of publicity before and during the event. This time I wanted to do it differently. The only thing I would know would be the destination. I’d look at the map each night and go from there. I would spend hours reflecting: as the pedals turn so the mind follows. So, in late September, I set off. I didn’t plan a route, I’ve always had others in the past to do that but as this was a solo journey, I was going to do it my way. I don’t like to know what’s around the corner, if it’s a big hill then so be it I’ll just have to climb it. I would set out each day with only a loose destination, no hotel booked, no roads worked out. The only perimeter would be the distance I felt I could be capable of. It was this that was my biggest surprise. I allowed myself to be free from plans and opting for the randomness of life, open to spontaneous acts. For this journey, I needed to be alone. After the toughest year of my life, I needed the physical challenge, the pain and the joy. This journey was to be a true test of myself.